Climbing in a prairie? Heck yes! This was an absolutely perfect night! A few months ago I was gravel biking and trying to get lost in the rolling hills to the west of Sioux Falls, SD. I stumbled upon this prairie reserve and wrote it down for future exploration. That was a good idea because this place was awesome! I was blown away by the quiet rustle of the trees and the wide open grassland that led out to a lake. Well, the problem with traditional underquilts with the bat hammock is the fact that they droop in the middle. In a normal hammock this droop helps contour to the body but in a bat hammock it leaves a gap between the quilt and the middle region of the hammock because the bat hammock lays so flat. You could try modifying one by adding a bunjee on both sides in the middle of the quilt so you can snug it up against the middle webbings on the bat hammock. I hope this made sense! I made all my underquilts so I don’t have a good answer for the best underquilt to buy. Next Next post: Cheapest Portaledge? 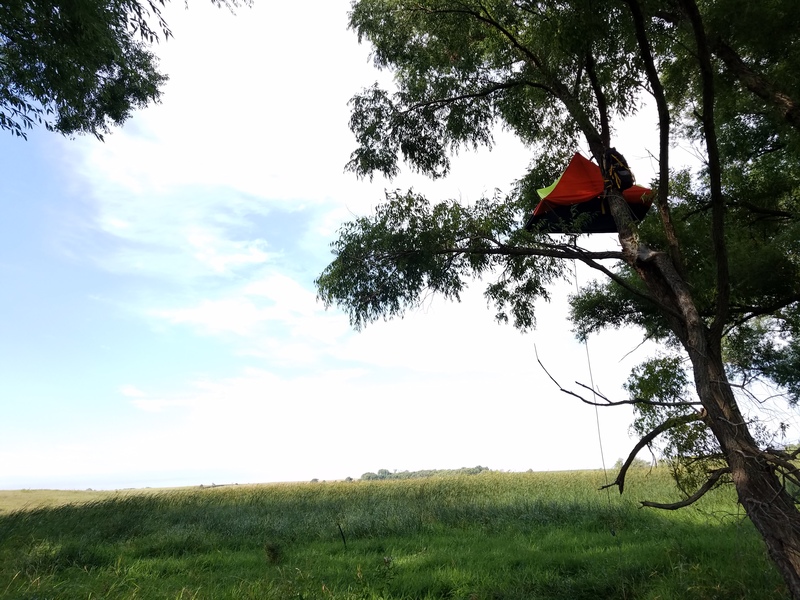 Full List of Tree Camping Shelters!